Wool Felt Beads - easy and fun to make - many styles. A Fun Easy Project For All! 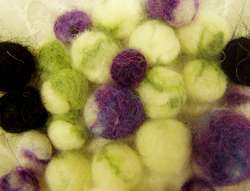 Wool felt beads are probably the easiest felted item to make. Well, I suppose the rope is easiest as there's no cutting involved. All you need to get started is some merino wool fiber (maybe a few colors depending on what you want to make), a bar of soap, hot water and your hands! There are several styles you can try. Here are just a few ideas to get you going, then you can experiment for yourself with colors and shapes. Pull off piece of wool fiber and fluff it or tease it apart with your fingers. Push the fiber into a wad that that you can hold in one hand orlayer the fiberthen roll it up gently - shorter lengths are easier to manage. Wet your hands with warm water one by one, then begin to roll thefiber back and forth between your hands to form a rope. At first it willstick to your hands - it may help if you wet the fiber underthe hot tap and squeeze gently until the fibers stick together a little. Start gently so the rope is formed evenly. Increase the pressure as you feel the rope begin to harden. After a few minutes the rope should be fairly firm. Cut the ropeinto pieces about the same length as they are thick. Lightly rub the flat cut end of a bead against your soap bar and roll thebead around in a circular motion between your hands making it round. Don't let your wool felt bead get soapy. Wipe the excess soap off with a paper towel and continue rolling your bead until it is round and evenly felted. You know it's finished when it is no longer fuzzy when you take your hand away. Rinse the soap out of your bead with cold water and allow it to dry. Repeat until you've used up all the bead pieces! What could be easier? Buying them? OH, COME ON!!! That's not nearly as much fun as making them!!! You could try makingfelted snakes now too. Find out how to make larger flat pieces of felt by hand. Anyway - if you find that the wool felt beads are smaller than you wanted, you can use them as 'spacers' for the larger beads you can make next! If you want larger beads, just use a thicker wad of wool fiber to make the rope - easy! If you want oval beads - cut each bead piece a little longer than the width of the rope. Instead of rolling the cut piece in a circular motion, keep rolling the bead like a rope. Push the ends in a little if you want a shorter oval. Rinse and allow to dry. Simple. If you'd prefer square wool felt beads...form larger round beads, then when they're dry trim them to shape by cutting off the curves. I guess you could do triangles the same way, but they could be more difficult to work out where to cut! I'm not going into faceting - that's WAY out of my league! Have you tried felting wool in your washing machine? Anyway - you can also make multi-colored wool felt beads. Basically the same way as above, but instead of just using one color, lay fine fluffed layers of several colors together to make the rope. Form the rope just the same. When you cut your bead lengths and roll them, the colors randomize around the bead. You could wrap tiny finely twisted strands of fiber around your beads after cutting and before felting for a different look. Merino is by far the easiest wool to felt due to its fine fibers, but you could also try making wool felt beads from alpaca (wonderfully soft and hypo-allergenic), llama or mohair, though these fibers do have longer hairs and will take longer to felt. Combine natural shades for subtle beads or use brightly colored dyed fibers for more striking looks. Really - you have the basics - get creative! Your imagination is your limit! Try out these easy felt projects next! You can mix equal parts craft glue and warm water, soak your already dry wool felt beads, squeeze them out (leave a little liquid in) and let them dry. This hardens the beads more and helps prevent them from becoming fuzzy with wear. You can string them on jewelery wire or yarn, elastic or even hemp. If you want to string on thicker hemp, you should probably poke holes through before the beads dry. Use a wood or metal skewer or cocktail stick while your beads are still wet. If your beads get a bit mis-shapen you can fix them before they dry. It all depends on the final look you want. The choice is yours. I hope you've enjoyed your look at making wool felt beads. Try them, you'll like them. Check out how to make flat pieces of wool felt by hand! There are 3 ways to felt wool. Do you know them all?